SB1147 Los Imagines, Coahuila, Mexico. It is very characteristic with multiple, very tight, thin and wavy ribs. Typically it has about 50 to 100 ribs, but plant whit up to 150 (or more) ribs has been reported. Origin and Habitat: Mexico (Coahuila, Chihuahua, Durango). Habitat: This species is native to high, dry, grassy meadowlands, during times of drought it often hides in the rocky soil. Brittonrosea multicostata (Hildm. ex Schum.) Speg. 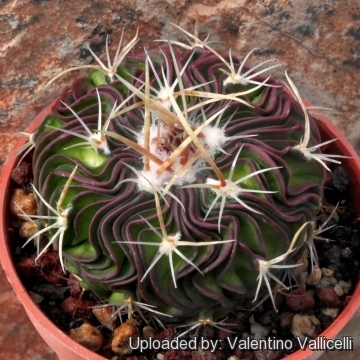 Stenocactus multicostatus subs. zacatecasensis (Britton & Rose) U.Guzmán & Vázq.-Ben. Stenocactus multicostatus f. cristatus hort. Echinofossulocactus multicostatus f. cristatus hort. Stenocactus multicostatus f. monstruosus hort. 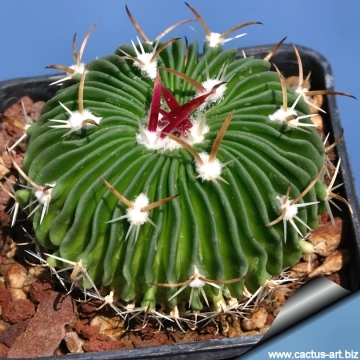 Echinofossulocactus multicostatus f. monstruosus hort. 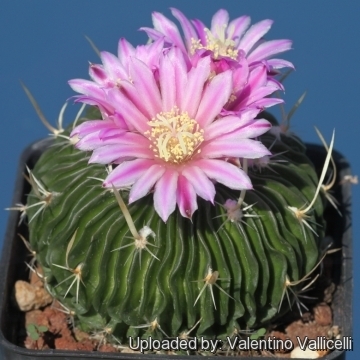 Description: Stenocactus multicostatus more often known as Echinofossulocactus multicostatus is a low-growing cactus with a lot of narrow, very acute and straight or wavy ribs, densely pleated together giving a wrinkled look to its near globular shape, with short 6 to 18 soft flattened brownish spines, arranged crosswise, but there is a great variation among plants of different origin both in spination, body shape and number of ribs. Since the various forms are connected by intermediates it is extremely difficult to recognize infraspecific taxa. Habit: It is simple, but sometimes forms two or more stems. Stem: 6-15 cm wide and up to 6-12 cm tall, depressed spherical, spherical to short-cylindrical usually many-ribbed, grey-green to deep green with a flat tops . Ribs: Many as the name implies, typically 50 to 100 (but occasionally up to 150 or more) very tight, thin, acute, wavy, very broad at the areoles. Radial spines: 4-6 to 9 of different lengths. 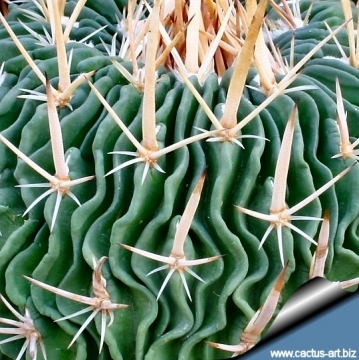 Central spines: (2-)4, upper one flattened and wide, creamy white to copper-brown, up to 5 cm long, 3-4 mm wide, lateral 2 even wider, angular, spreading, while the lower ones are shorter and point downwards. Flowers: From the plant crown, about 2,5 cm, wide, with a short tube, white, pinkish purple or violet (or rarely yellowish) with a darker violet to purple midvein in early spring. Stenocactus erectocentrus hort. 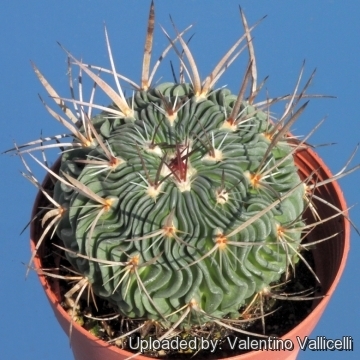 : ( Stenocactus multicostatus ? ) Plant with beautiful spination. The upper spines are very long whit a central stout and flat erected spine, while the lower ones are shorter and point downwards. The spines are different lengths. 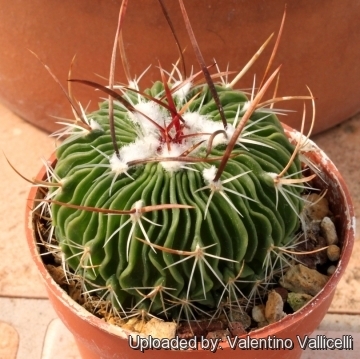 Stenocactus lloydii (Britton & Rose) A.Berger: has long white to dark red papery spines. Ribs very tight wavy. Flowers white/purple almost concealed among the spines. "lloydii" and "multicostatus" are considered part of a multiform species. 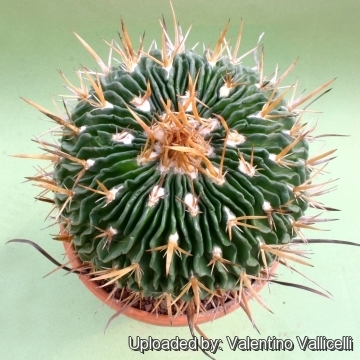 Stenocactus multicostatus (Hildm. ex K.Schum.) A.Berger: It is very characteristic, typically with 50 to 100 (or more) very tight, thin and wavy ribs. It is indeed very variable. Stenocactus multicostatus f. monstruosus hort. : Monstrous form with very long areoles forming vertical comb-like lines of spines. 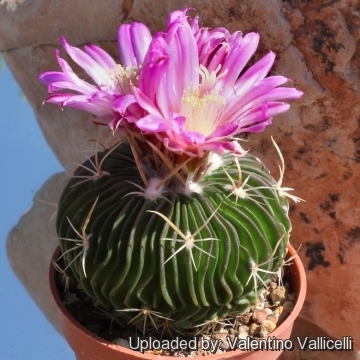 Stenocactus multicostatus subs. zacatecasensis (Britton & Rose) U.Guzmán & Vázq.-Ben. : has 3 brownish, not annulate central spines of which the middle one is flat. Flowers nearly white or with a pink mid-vein and the apex of the plant umbilicate. Distribution: North Zacatecas, Mexico. Notes: The plant of this species found in cultivation are quite variable, and the dissimilarity among seedlings spination and ribs shape may be considerable. Cultivation and Propagation: Small growing and easy to to care and flower. Because of it’s small size makes a great potted plant specimen, great for beginning collectors. Growth rate: It is a slow growing species. Repotting: Use pot with good drainage. Eventually, as they become mature, they attain a maximum size of 20 cm. However, old plants become senile and have a tendency to succumb to disease and a weak root system. At this stage, as is well known, they die suddenly. 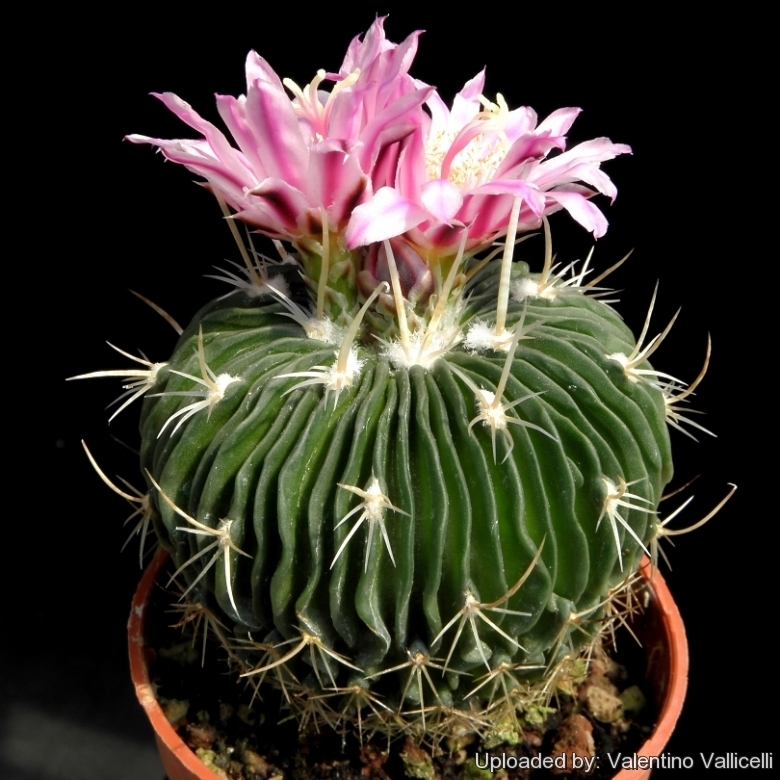 So, after they reach 10 cm in diameter grow them slowly, and adopt a new repotting period, using intervals of every 2 - 3 years. Additionally grow them under drier conditions or with stronger sunlight. Watering: Water regularly during the summer so long as the plant pot is allowed to drain and not sit in a tray of water (It rots easily, especially if over wet). Let dry between watering. During hot weather you may need to water the plants more frequently so long as the plant is actively growing. From late September watering should be reduced to force the plant to go in to a state of semi dormancy, by October you should be back in to the winter watering regime. If the soil is allowed to be dry for too long root loss could follow but equally the same result would occur if the plants are both wet and cold. From March onwards the plant will begin to grow and watering should be increased gradually until late May when the plant should be in full growth. Fertilization: Feed with a high potassium fertilizer in summer. Feeding may not be necessary at all if the compost is fresh then, feed in summer only if the plant hasn't been repotted recently. Do not feed the plants from September onwards as this can cause lush growth which can be fatal during the darker cold months. Hardiness: When dormant, the plant is very cold tolerant (down to nearly -5° C or less), but when left out it is more sensitive to frost. During the summer it is best to keep the plants outside where the temperature can rise to over 30 C with no harm to the plant. Exposure: They do need a lot of light to develop their typical spination, but different clones vary in their tolerance of full sunshine. However some protection in light shade is recommended during the hottest hours in summer. If kept too dark they may become overly lush and greener and could be prone to rotting due to over watering. Propagation: Seeds (usually), remembering that seedlings dislike strong light and dry conditions and need to be repotted frequently, or by the shoots of adult plants (if available). If you remove an offset, remember to let it dry for some days, letting the wound heal (cuttings planted too soon easily rot before they can grow roots). Lay it on the soil and insert the stem end partially into the substrate. Try to keep the cutting somewhat upright so that the roots are able to grow downward.